How do you feel about GM food? 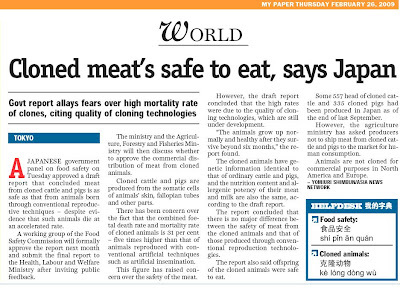 Would you consume meat which is cloned as shown in the news article from my paper below? Genetically modified (GM) organisms are plants or animals that have had one or a few selected genes introduced into them through genetic engineering techniques. Examples include potatoes and corn that are resistant to insects and soya beans that are resistant to certain types of herbicide. What's the difference between GM and conventional breeding? Conventional breeding, also known as selective breeding, is an inexact science, and involves the random transfer of thousands of genes. Genetic modification is generally faster and more specific than traditional breeding methods. It can also overcome natural barriers that limited breeders in the past. For example, cross-breeding of a plant with a bacterium was impossible, but GM techniques allow bacteria DNA to be inserted into a crop, to make it resistant to the pest. Are there GM foods on the market? Yes. These come mainly from maize, soya bean and canola and can also be found in ingredients in refined products such as corn syrup. There are no scientific studies to date that show that GM foods are dangerous. All GMO foods here are certified safe from their countries of origin. The authorities also perform stringent checks on importers of GM foods. Are GM foods more nutritious? They are generally equivalent to conventional food products in terms of nutritional value. Whole foods like grains, fruits and vegetables can be modified to contain more vitamins, proteins or even less fat, but none are being sold commercially so far. Is there any way to tell if a food product is GM? Not for shoppers here, because products are not labelled as such. Consumers who wish to avoid GM foods can opt for organic foods or foods with the 'non-GMO' label, says the Agri-Food and Veterinary Authority (AVA). 0 Response to "GM Food"